Help us fill our window with love and life! 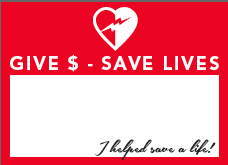 ​All month we will hang a lifesaving heart in the window for every donation received. Minimum donation for a window heart is $50. The LACF AED grant program allows a non-profit, government or civic agency to apply for an AED machine with a matching grant from Sanford Luverne. This year we will start offering AED owners the option to apply for dollars to replace their expired pads and batteries. Join us the month of February as we raise funds to continue this life saving grants program. Select a donation amount below & use our secure check out to start saving lives. Make sure to tell us whose name you want on the donation heart.